The annual Hawke’s Bay Primary Sector Awards were filled with emotion as the late Renata Apatu’s life’s work was honoured. Apatu, who died after a commercial helicopter crash at Ngamatea Station in June last year, was named as the Hastings District Council Hawke’s Bay Primary Sector Industry Leader Award winner. The award was presented to Apatu’s wife, Sally Apatu. Mayor Sandra Hazlehurst presented the award and noted Apatu was being honoured posthumously for his leadership, passion and commitment to the primary sector in farming and in particular in his work for wool. . .
Fifty workers, two cooks, 42,000 ewes, 25,000 lambs, almost 1000 bales of wool and at least two weeks. Thirty chickens, 30 sheep, two deer, six pigs, two boxes of fish and a whopping 300kg of spuds plus all the other vegetables. Shearers are notorious for their prodigious appetites but shearing at Apatu family-owned Ngamatea Station is several orders of magnitude above anywhere else in the North Island. . .
With increasing pressure on farmers from national policy, regional councils and the public to reduce the environmental impacts of their farms, farmers should have a Land and Environment Plan (LEP) in place and begin mitigating potential environmental risks, Beef + Lamb New Zealand regional associate Briar Huggett says. A plan begins with a farm assessment, which should be followed by responses to possible environmental risks in a detailed strategy. “The key environmental risks on farms are nitrogen, phosphorus, sediment and bacteria loss to water ways,” Hugget said. The first step in making a plan is to use an aerial farm map to mark farm resources and pinpoint likely hot spots for potential environmental risks. . .
Webber Family Farm, owned and operated by Ross and Eleanore Webber, was announced the Regional Supreme Winner at this evening’s 2019 Auckland Ballance Farm Environment Awards run by the New Zealand Farm Environment Trust. The Ballance Farm Environment Awards champion sustainable farming and growing through an awards programme which sees one Regional Supreme Winner selected from each of the 11 regions involved. These Regional Supreme Winners will be profiled at the Awards’ National Sustainability Showcase in Hamilton, on Thursday 6 June, with each in the running for the Gordon Stephenson Trophy. . . The winners of the 2019 Southland-Otago Dairy Industry Awards Share Farmer of the Year competition believe strong relationships and networks are key to their successful business. Cameron and Nicola van Dorsten were announced winners of the region’s Share Farmer of the Year competition at the Southland/Otago Dairy Industry Awards annual dinner held at the Bill Richardson Transport World in Invercargill last night. The other big winners were James Matheson who was named the 2019 Southland/Otago Dairy Manager of the Year, and Caycee Cormack the 2019 Southland/Otago Dairy Trainee of the Year. . . I guess we are accidental farmers; I bought a farm at Tom’s Creek, NSW, to run and write, and Ged had his bush block up the road to retreat to and raise cattle on. I met Ged when he came to quote an upgrade of the tiny solar system; he told me I would never be able to use a hairdryer, toaster, electric kettle or vacuum cleaner again. Back then we used 1 kilowatt with 15kw/hour of battery storage, now it is 8kw of solar with 100 kw/h of storage that runs two houses, six freezers, fridge, lights, hoover, electric kettle and toaster and air conditioner. . .
That passion has led her to launch her own fledgling business, The Sheep’s Back, in a bid to promote the natural fibre and teach the art of knitting. Mrs Bulleid and husband Chris, who have children Dylan, Gemma and Blake, farm sheep and beef at Longridge North in Northern Southland. It is a third-generation family farm and they run 4500 Romney breeding ewes and 1200 hoggets in conjunction with a breeding and finishing cow herd. . .
Amy Watts might spend her days working with animals but, as she puts it, her job is really about working with farmers. And it was those relationships forged with farmers throughout Central Otago that ‘‘makes’’ her job as a vet. A large animal vet, predominantly working with sheep, beef and deer, Ms Watts said it was the relationships — and learning from each other — that made it a rewarding career. Originally from a farm in Hawkes Bay, she did not get accepted into vet school at Massey University the first time around. . .
Three “game-changing” New Zealand apricot varieties have just been commercially released to growers this season. The new trees produced their first fruit this season since being planted several years ago, but it will be another few years before commercial quantities are picked and marketing of the fruit gets underway – both domestically and overseas. The new varieties are the result of a partnership between industry group Summerfruit NZ and Crown Research Institute Plant & Food Research. It has been described as a painstakingly slow process, with varieties selected for desirable attributes and then crossed with other varieties, leaving researchers to wait several years to see the outcome. . .
White Rock Mains, owned and operated by Duncan and Tina Mackintosh, was announced the Regional Supreme Winner at this evening’s 2019 Canterbury Ballance Farm Environment Awards run by the New Zealand Farm Environment Trust. The Ballance Farm Environment Awards champion sustainable farming and growing through an awards programme which sees one Regional Supreme Winner selected from each of the 11 regions involved. These Regional Supreme Winners will be profiled at the Awards’ National Sustainability Showcase in Hamilton, on Thursday 6 June, with each in the running for the Gordon Stephenson Trophy. The Mackintoshes are Regional Supreme Winners thanks to their determination and hard work, particularly in regard to helping their environment prosper. The couple recently established a 91ha QEII covenant on-farm. . .
Hawke’s Bay dairy farmers, Nick and Nicky Dawson, have won the East Coast Ballance Farm Environment Awards. The couple have farmed the 186ha property, Glenelg, at Patoka in the Hastings district since 2001. Since then, the structure has evolved to become a 50:50 equity partnership with Opiki dairy farmers Stuart and Ann McPhail, trading as Great Glen Farming Ltd.
Outside the partnership, the Dawsons are leasing a neighbouring 500ha sheep and beef farm, which is run by their son Ben. They also have two daughters, Libby at university and Felicity in Year 11. . .
Ice chunks the size of small cars ripped through barns and farmhouses. Baby calves were swept into freezing floodwaters, washing up dead along the banks of swollen rivers. Farm fields were now lakes. The record floods that have pummeled the Midwest are inflicting a devastating toll on farmers and ranchers at a moment when they can least afford it, raising fears that this natural disaster will become a breaking point for farms weighed down by falling incomes, rising bankruptcies and the fallout from President Trump’s trade policies. “When you’re losing money to start with, how do you take on extra losses?” asked Clint Pischel, 23, of Niobrara, Neb., whose lowland fields were flooded by the ice-filled Niobrara River after a dam failed. He spent Monday gathering 30 dead baby calves from his family’s ranch in this northern region of the state, finding their bodies under huge chunks of ice. . .
With almost half of New Zealand’s land area committed to pasture and crops it would be easy to think that despite our growing population there is still plenty of land to spare. But in the past two decades some of the country’s highest quality land has gone under cement and tarmac for urban development. Despite having a population the size of Melbourne in a land area the size of Britain some people are starting to question whether a country that earns its living off its soils can afford to keep paving over its key resource to support population growth. The loss of productive soils to housing is a subject economist Shamubeel Eaqub has given considerable thought. . .
Sheep and beef farmers James and Sarah Glenn are fuelling the intergenerational Sheep and beef farmers James and Sarah Glenn are fuelling the intergenerational transfer of their farming business with a rare mix of bulls, sheep and tepees. Luke Chivers reports. On a coastal slice of rural New Zealand a young couple are combining their passion for family with farming and tepees. Te Akau sheep and beef farmers James and Sarah Glenn have a longstanding connection with the primary sector. Farming dominated their teenage years. . .
Otago woman Elizabeth Graham (21) has won a national stock judging competition in Christchurch. She is a member of the Strath Taieri Young Farmers Club, and while at the New Zealand Young Farmers Conference in Christchurch earlier this month, won the stock judging competition. The competition attracted the young farmers teams from throughout the country. ”It was a huge honour to take out the overall title,” she said. ”This year’s competition included alpacas, which made things a little interesting.” . . The recipient of New Zealand’s top sustainable farming award says she’d like to see more kiwifruit orchardists provide full-time employment for their staff. Organic kiwifruit grower Catriona White and her husband Mark are the first horticulturists to win the Gordon Stephenson trophy, which is awarded to one of the 11 regional winners in the annual Farm Environment Awards. Catriona says she and Mark pay two staff on their Opotiki orchard for a 40-hour week regardless of whether the weather allows them to work the hours or not. “You look after your staff and your staff look after you.” . . The Federated Farmers Meat & Wool Council is calling for compulsory regulation of the stock agent industry. “No-one likes more rules and regulation but to protect all parties in the sale of livestock we believe it is the best way forward,” Feds’ Meat & Wool chairperson Miles Anderson says. The NZ Stock and Station Agents Association has created a code of conduct and set up an independent body that can adjudicate on complaints about the actions of stock agents. . . Cows and bulls searching for “moo love” now have a mobile app to help their breeders. A U.K. farming startup introduced a Tinder-style app, called Tudder, that lets farmers find breeding matches by viewing pictures of cattle with details of their age, location and owner. Users hear a mooing sound as they swipe — right to show they’re interested or left to reject possible matches. Hectare, which designed the app, says it “seeks to unite sheepish farm animals with their soulmates.” Selling animals using social media can speed up a process that often involves transporting animals long distances for breeding. . .
Trevor Courtney has always liked beer, and now the drummer for ’60s band Chants R& B is growing his own hops. After a 40-year music career, Trevor and his wife Lyndsay now have a lifestyle block in North Canterbury where they grow hops plants, heritage apples and saffron. Trevor and Lyndsay’s eight-hectare property is home to two flocks of Wiltshire sheep, but they’re pretty low-maintenance, Trevor says. “In the spring they start to shed their fleece, so there’s no shearing,…you can leave their tails on. We only meet up with them a couple of times a year.” . .
(BusinessDesk) – Red meat cooperative Alliance Group more than halved its net profit as it paid more for livestock and in tax, interest and administration costs. Net profit for the year ended September fell to $6.6 million from $14.4 million a year earlier, the Invercargill-based co-operative said in its annual report. Revenue, however, lifted to $1.8 billion from $1.5 billion in the prior year and it paid more than $1.2 billion to its farmer-shareholders. The group also paid $14.6 million in loyalty payments and another $31.6 million in advance payments to support farmers during periods of low cash flow. . . Trying different things, learning from mistakes, and working with Mother Nature are part of the ethos of this year’s national Ballance farm environment award winners. As winners of the Gordon Stephenson Trophy, Bay of Plenty kiwifruit growers Mark and Catriona White are officially ‘national ambassadors for sustainable farming and growing’. During a round of meetings with agriculture agency representatives and MP Todd Muller in Wellington this month, the Whites dropped into Federated Farmers’ HQ to swap war stories on topics as diverse as workforce shortages, genetic engineering and whether farmers/ growers who repeatedly fail to heed sustainability messages should be left behind. . .
New Zealand’s booming apple and pear industry is already promising great career opportunities for the first graduates of a new stand-alone Bachelor’s Degree in Horticulture. Recruitment is underway for the new three-year degree that starts in February 2019 with a fully industry-sponsored 4ha apple innovation orchard at Massey University’s Palmerston North campus. New Zealand Apples & Pears capability manager Erin Simpson, who has been a driving force behind the new degree, said never before has there been a more exciting time for young people to enter the industry which is offering them a bright and rewarding future. . . The Fonterra Shareholders’ Council has confirmed that a second election for the remaining vacancy on Fonterra’s Board of Directors will be held in December. Voting will open on 3 December and close at 1.00pm on 20 December, and the results will be announced later the same day. Only two candidates from the first election, Leonie Guiney and Peter McBride, obtained more than 50% support from voting shareholders. The Rules of the first election state that if not enough candidates obtain more than 50% support, there must be a second election. . .
Manawatū agricultural contractor Mike Hancock is helping to feed some of the world’s most stunning and endangered animals. The 23-year-old is a joint operations manager for Bruce Gordon Contracting, north of Marton. Earlier this year the company received a phone call from Auckland Zoo, almost 500 kilometres away. . .
At 194 centimetres high, WA-born steer Knickers is believed to be the tallest in Australia — and one of the tallest in the world. To put it into perspective, the seven-year-old is almost as tall as NBA star Michael Jordan and weighs more than a Mini Cooper car at about 1,400 kilograms. That’s double the weight of the average Holstein Friesian and half a metre taller — and could make more than 4,000 hamburger lovers happy. But owner Geoff Pearson of Lake Preston in the state’s south-west said Knickers was not destined for the barbecue anytime soon. . .
Soya, almond, oat… Whether for health issues, animal welfare or the future of the planet, ‘alt-milks’ have never been more popular. Are we approaching dairy’s final days? A couple of weeks ago, some eye-catching billboards began appearing around central and east London. Entire tunnels of the underground were plastered with the adverts; the sides of large buildings were covered. On one panel there was a carton (or, in some instances, three) of Oatly, an oat drink made by a cult Swedish company that favours stark graphics, a bluey-grey colour scheme, and which is a market leader – in a not uncompetitive field – in the tongue-in-cheek promotional messages known as “wackaging”. The adjacent panel, in large, wobbly type, read: “It’s like milk, but made for humans.” . .
Each summer a massive $5.25 million irrigation system is cranked on at the National Elk Refuge, showering beads of water over nearly a fifth of the preserve’s 25,000 grassy acres. With no crops growing and no livestock in sight, tourists and newcomers to Jackson Hole who catch a glimpse must occasionally be bewildered. But there are actually many reasons for the refuge’s irrigation system, new as of 2010. . . The @NatlElkRefuge located in Wyoming is home to the largest Elk herds (also known as Wapiti) on the planet! Bay of Plenty Kiwifruit Growers Mark and Catriona White Are the New National Ambassadors for Sustainable Farming and Growing. The New Zealand Farm Environment Trust (NZFET) runs the Ballance Farm Environment Awards and announced the Recipients of the Gordon Stephenson Trophy at an awards function at Te Papa in Wellington on Thursday night – chosen from 11 regional supreme winners gathered from throughout the country. Ten years ago, the Whites embarked on a quest to find an improved lifestyle for their family away from the city and found it on a bare block of land near Opotiki. Their work and passion has transformed a 5.85ha section of a former organic dairy farm into the Coastal Kiwis Orchard it is today. Former national ambassador Dianne Kidd from Helensville, who chaired the judging panel, says the Whites demonstrate an excellent understanding of all aspects of sustainable food production. She says Mark and Catriona show a respect for the Maori principles of kaitiakitanga – acting as guardian, protector and conserver – within their kiwifruit orchard management. Catriona’s family has been on the farm for four generations. Although they initially did not know much about kiwifruit, the couple did most of the physical development work themselves, keeping costs down and learning by their mistakes. Mark also did a National Certificate in Horticulture. The orchard is BioGro certified. It has 3.19 ha of Zespri Organic Green kiwifruit, producing in 2017 a total of 23,483 trays of kiwi-start fruit. Zespri Organic SunGold (G3) is currently grown on 2.65 ha producing 38,362 trays. This production was achieved in a “challenging growing year” which included various cyclones and a very wet and windy autumn. Recently developed blocks of SunGold have come into production this season. Alongside Kidd on the national judging panel were Warwick Catto from Ballance Agri-Nutrients, NZFET’s Jamie Strang, George Murdoch from Rabobank and Julia Jones from KPMG. “New Zealand can be proud of the global leading achievements of our farmers and growers,” Kidd says. The supreme winners of 11 regional awards were invited to the Showcase in Wellington to be considered for the trophy named in honour of Waikato farmer and noted conservationist, the late Gordon Stephenson. As a national award it is separate to the regional programme and judged under different criteria. This Saturday (6 May) thousands of farmers will open their properties up to hunters for the opening of the 2017 duck shooting season. Throughout the year farmers provide access to waterways across their properties – to enable anglers the opportunity of catching trout. Farmers, often in partnership with their local fish and game folk, have spent significant time and money creating and restoring wetland habitats. Strong friendships have been established between hunters/anglers and landowners. In recognition of this partnership, resident landowners and their families do not need a Fish and Game licence to shoot or fish on their own properties. In some regions the Fish and Game licence revenue has been used to make the life of landowners that much more difficult. As a result, some Fish and Game licence holders may not face the same friendly welcome by their farmer friends this year. . .
Crown Irrigation Investments Ltd. (Crown Irrigation) has agreed development grant funding of $388,000 for Kurow Duntroon Irrigation Company (KDIC), matching the company’s own financial contribution for this development phase. The funding is required to complete the remaining work to reach construction commencement and confirm the commercial viability of the proposed scheme. The current community-based scheme was established in 1965 irrigating on the south bank of the Waitaki River below the dam, however it is now in need of major work. KDIC is seeking to upgrade and expand the existing open canal scheme with a fully piped system capable of expanding irrigation capacity from its existing 1,986ha to potentially 6,000ha. The water supply comprises consented takes from the Waitaki dam and river together with additional supply from the existing McKenzie Irrigation Company. . .
A biosecurity response is underway after the detection of myrtle rust on mainland New Zealand for the first time, Primary Industries Minister Nathan Guy and Conservation Minister Maggie Barry have announced today. 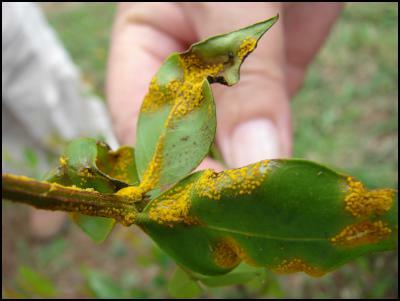 Myrtle rust is a fungal disease which can seriously damage various species of native and introduced plants in the myrtle family, including pohutukawa, rata, manuka, gum, bottlebrush and feijoa. “The Ministry for Primary Industries (MPI) was notified on Tuesday evening by a nursery in Kerikeri that five pohutakawa seedlings had suspected myrtle rust, and laboratory testing has now confirmed this,” says Mr Guy. “MPI has moved quickly and initiated a Restricted Place notice to restrict the movement of any plants and people at the site, and is treating nursery stock with fungicide spray as a precaution. Work is also underway to trace any stock that has left the nursery and all other nurseries in Kerikeri are being inspected today. . . The overwhelming majority of New Zealand’s commercial fisheries are performing well, according to MPI’s latest stock assessments. The Status of New Zealand’s Fisheries report for 2016 released this week shows a record percentage of the tonnage and value of landings of scientifically evaluated stocks have no sustainability issues. The report shows ninety seven percent of scientifically evaluated landings were from stocks above or well above sustainable levels, Seafood New Zealand chief executive Tim Pankhurst said. “The figures show that New Zealand continues to be a world leader in fisheries management,” he said. . .
Scientists have managed to successfully breed blue cod for the first time, a milestone that will support the development of a new aquaculture industry for New Zealand. In association with Ngāi Tahu Seafood Ltd, the Seafood Technologies team at Plant & Food Research in Nelson are investigating how to breed different species of native fish in captivity, building knowledge of the conditions required for the fish to successfully reproduce. For the first time, they have managed to breed and grow blue cod to fingerlings. New Zealand can now consider potential opportunities for this desirable table fish, such as intensive aquaculture grow out or supplementing local populations under pressure from fishing. . .
Ara Institute of Canterbury’s proposal to restructure Primary Industries programmes is designed to adjust provision to align with industry demands, Chief Executive Kay Giles said. “It is our responsibility to the Timaru community and the Primary Industries sector to adjust the portfolio to offer the right programmes for the needs of employers. There has been very little demand for the particular programmes that are under review so we need to put our energy where there will be much more value for the primary sector.” . .
Southland is hosting the National Sustainability Showcase of the Ballance Farm Environment Awards for the first time at the end of this month. Up to 400 people will be attending a gala dinner at the Ascot Park Hotel in Invercargill on Wednesday May 31. Tickets are on sale on http://www.bfea.org.nz. Eleven award ceremonies have already been held around the country and each regional supreme winner has been invited to the Showcase to be considered for the Gordon Stephenson Trophy – named in honour of Waikato farmer and noted conservationist, the late Gordon Stephenson. . .
We had just wrapped up a team presentation to our Board of Directors. The comment came across as a compliment, so I smiled and politely responded that I love my work here. On the drive home, and numerous times since that day, I found myself thinking about his comment. I’ve never worked anywhere else. Or at least a real “grown-up job” anywhere else. Since I sat down at my first Farm Credit desk as a 21 year old intern, I’ve never left. The offers have been there. But I could list on a single hand the hours I’ve actually contemplated leaving. . .
KPMG’s Ian Proudfoot says significant change is coming to New Zealand’s primary sector and “farmers that ignore it do it at their peril”. Mr Proudfoot was speaking this morning at Federated Farmers’ National Conference Meat and Fibre AGM. The world was on the cusp of a fourth industrial revolution and this would mean thinking more globally. Kiwi farmers who could tell their unique story would prevail as the global consumer became more discerning about what they eat and where it came from. “There is a fusion happening where digital, physical and biotechnological products will redefine how we live and farm,” he said. . . There is one thing in life that never changes. The moment you overcome one challenge, there is sure to be another. Once in a while a challenge crops up that might be easier to abandon, but that’s not my way. You guessed it, that last reference is to the New Zealand red meat industry. At our February meeting we discussed our role going forward. The emphasis was on continued dialogue with key players, notably Beef + Lamb, the Meat Industry Association, Meat Industry Excellence Group and other parties keen to engage. There have been plenty of people willing to engage, some notable for their commercial self-interest, and others to talk about specific elements within the industry. All have relevant ideas and the passion and desire to see the industry move forward. But until key players come together with a common goal, the quantum shift required will not occur. . .
Good morning colleagues, observers, media, and of course all the keyboard warriors and trolls waiting in anticipation. Another season has gone by and whilst there are some positive noises out there around potential market improvements, the prices we all face are still below the break even point for many of us. The expectation is that the financial implications of this downturn will see us in pain for a few years to come. Much of the commentary over the past few days has been around the Brexit, and the fallout from it. One might ask, what this means for New Zealand Dairy? It really is all up in the air at the moment, our exports presently to the UK are pretty minimal. . .
Richard and Dianne clearly share a deep passion for their family’s show piece farm on the edge of Auckland city. Their beef breeding and sheep breeding and finishing operation runs 4820 stock units on 331ha (effective) with a pine woodlot established on 18.5ha and 15.3ha of regenerating native bush. Richard and Dianne, who have three adult sons, have farmed the flat to easy-rolling property since the late 1970s. They are pragmatic about protecting the environment for future generations. All waterways have been fenced, and large areas of raupo act as sediment traps to capture nutrients. Biodiversity corridors link the upper catchment areas to the bush, and bush remnants have been planted with native species such as kauri, rimu and pohutukawa. Whenuanui runs 300 Angus breeding cows and a Coopworth ewe flock. Mixed-age ewes lambed at 162 percent last year, with hoggets achieving an impressive 129 percent. All lambs are sold prime under the “Kaipara Lamb” brand. . .
New Zealand’s world leading apple industry is putting a call out to school leavers and graduates across the country to come share in its success. Pipfruit New Zealand’s new capability development manager Erin Simpson has been charged with growing and retaining young people into Zealand’s apple and pear industry. “New Zealand apples are leading the world, the industry is dynamic, innovative, and going places and so can young New Zealanders,” said Mr Simpson . .
Congratulations to Brenton O’Riley who became the Bayer Marlborough Young Viticulturist of the Year 2016 on Friday 24 June. O’Riley has worked at Giesen Wines for the last few years as Viticultural Technician and credits his time and experience there as helping him gain some of the high level knowledge and skills required to win the competition. He is due to start a new job at Pernod Ricard in a grower liaison role at the beginning of next month. This is the second time O’Riley has won the Marlborough competition, previously in 2014, so he will be even more determined this year to win the National Final taking place locally at Villa Maria in August. . . The Irish Department of Agriculture, Food and the Marine’s (DAFM) 10 year strategy report named Foodwise 2025 contains a lot of the same features as MPI’s ambition to double agricultural exports over a similar timeframe. As an agricultural producer Ireland also has many of the same characteristics as New Zealand: a rural economy based heavily on grass-fed production and produce from the sea, a small domestic market and heavy reliance on exports, an expanding dairy herd and an ageing farmer profile. The agri-food industry contributes a greater proportion of export revenue than non agri-food production which is equally true of New Zealand. Obviously there are differences, notably the impact of the EU common agricultural policy on Irish farm incomes, the destination of exports, the lower efficiency and smaller scale of farms, and the variation of production volumes. . .
(BusinessDesk) – New Zealand’s sheepmeat exports and tourists from the UK may be the hardest hit from the Brexit with the most immediate impact likely to be on British tourists suddenly finding the spending power of the pound against the kiwi is the weakest in almost three years. The European Union is the biggest market for New Zealand sheepmeat, taking $1.4 billion of product last year and almost half of that 228,000 tonnes of quota is taken by the UK. Total red meat exports to the EU amount to $2 billion, making it the single most valuable market. However, the biggest impact for New Zealand would be the UK’s loss of zero-tariff access for its own sheepmeat into Europe, where it currently sends 90 percent of production, leaving more in its domestic market. . .